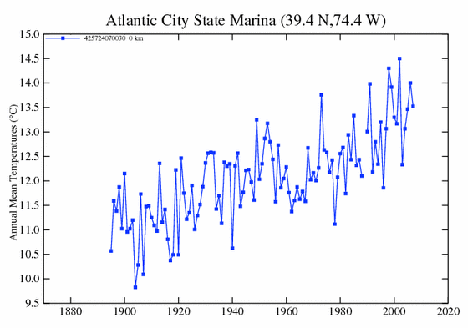 Crossing from Delaware into New Jersey as I come toward the end of the data acquisition part of the project I started last year looking at state temperatures over the past one hundred and fifteen years, I find that New Jersey has a dozen USHCN stations. Location of the USHCN stations in New Jersey (CDIAC ). 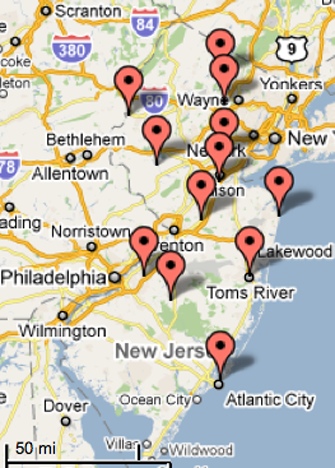 According to the list, the only GISS station in the state is in Atlantic City. 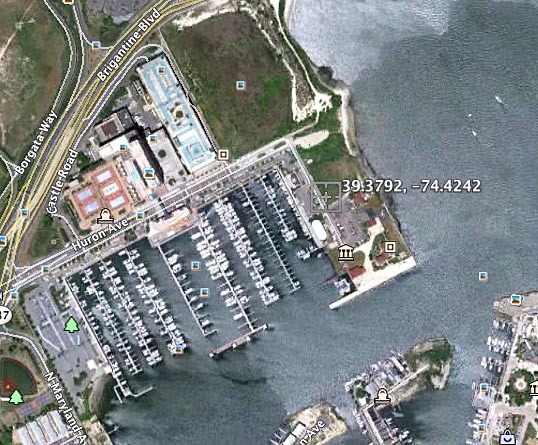 There have been 3 stations there, one that ran from 1895 to 2008, down at the Marina. 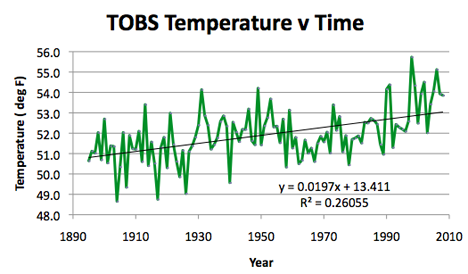 This clearly shows the drop in temperature in the 1948 – 1965 period that I have been mentioning in the last few posts on the subject. 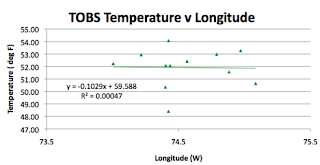 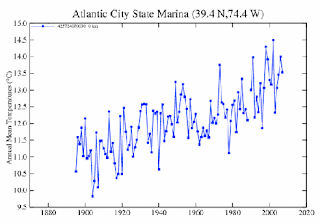 Longer term temperature profile reported for the GISS station in Atlantic City (GISS ). 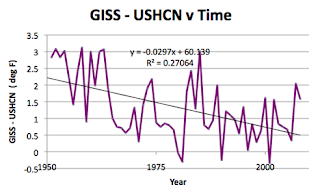 However, as has become evident in many states that I have reviewed, the one that is being used by GISS has a much more recent history, only having been in operation since 1951. That record also clearly shows the temperature drop, though with the start in 1951, it is not as clear that this is an anomaly from the overall rising trend. 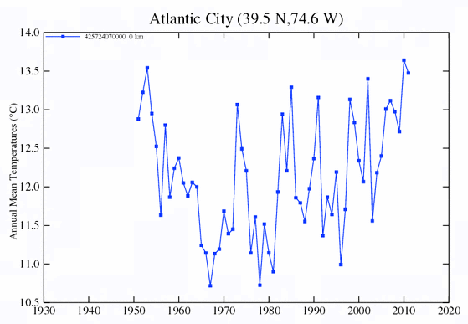 Reported temperatures for the GISS station currently being used in Atlantic City (GISS ). Given the steady rise in temperature of the station at the Marina, I was curious to see how far from the sea the new station is. 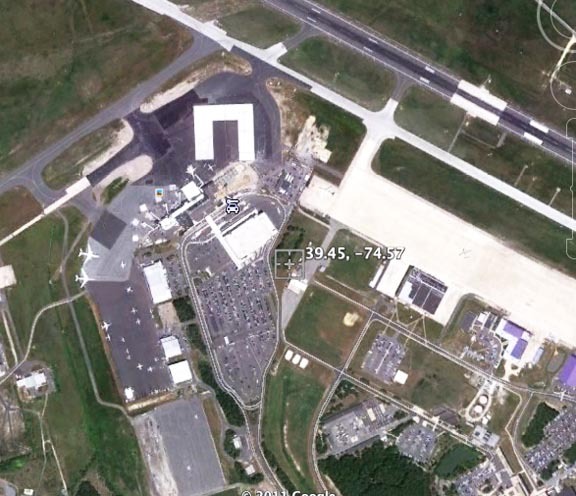 It turns out to be at the airport, which is 9 miles from the sea, and 23 m above sea level. 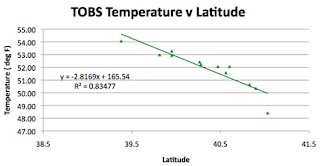 New Jersey is 150 miles long and 70 miles wide, running from 73.9 deg W to 75.58 deg W, and 38.9 deg N to 41.3 deg W. The mean latitude is 40.1 deg , that if the USHCN stations is 40.3 deg N, and the GISS station is at 39.45 deg N. The elevation of the state runs from sea level to 549 m, with a mean elevation of 76.2 m. The mean USHCN station is at 53.9 m, while the GISS station is at 23 m.
Because of the short interval for which information from the current GISS station has been presented, the difference between it and the USHCN average is relatively short. 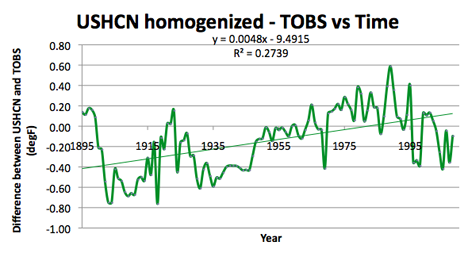 Change in the TOBS temperatures, on average, for the USHCN stations in New Jersey. It is clear that the broadly consistent finding from other states on the role of elevation is valid also here, even with relatively smaller elevation changes. 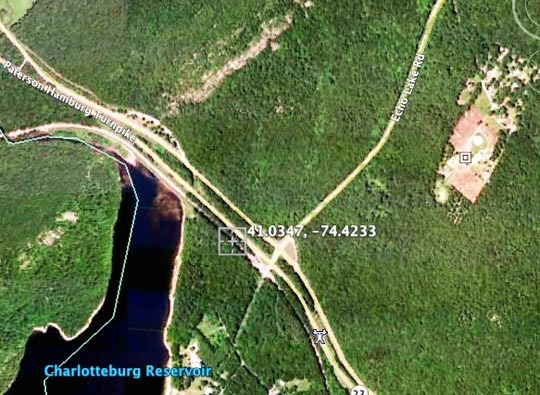 When looking for populations, Charlotteburg has only one farm by it at the moment, but there are two sets of sub-divisions being developed in the neighborhood, which may have a significant impact on recorded temperatures in the future, though the reservoir may have a stabilizing effect. 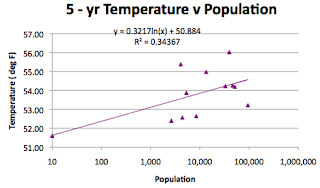 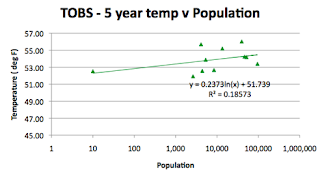 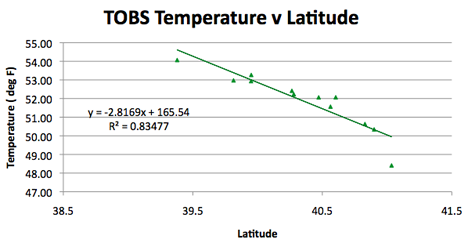 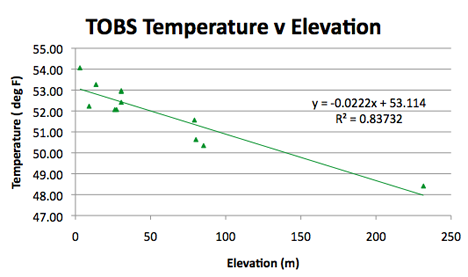 Effect of local population on TOBS temperature for the USHCN stations in New Jersey. 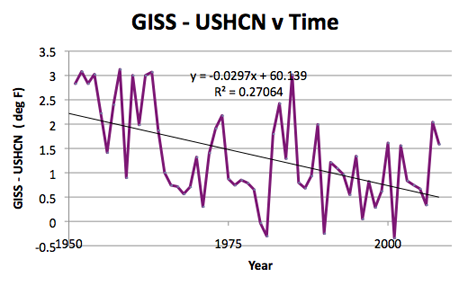 Interestingly the homogenization of the data for the USHCN reported temperatures also creates a higher R^2 for this state. Effect of local population on homogenized temperature for the USHCN stations in New Jersey. 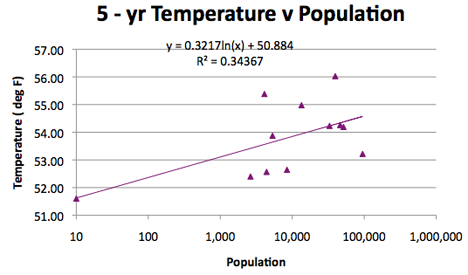 Which suggests there might be some difference between the two sets of data, as there would appear to be. 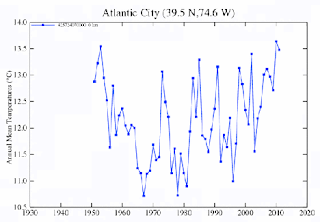 The recent drop is a little less than common to many earlier states.